CLS: “common language specification”, set of rules that describe what features a .NET-aware compiler must support to produce code that can be hosted by the CLR. It’s a subset of the full functionality defined by the CTS (common type specification). Using keyword is just shorthand notation, using it or the fully qualified name has no effect on performance or the size of the assembly. CIL code always uses fully qualified names. type: generic term used to refer to: class, structure, interface, enumeration, delegate. type member: constructor, finalizer, static constructor, nested type, operator, method, property, indexer, field, read only field, constant, event. static members are bound at the class level, instance members are bound at the object level. interface: collection of abstract members that provide a contract between the object and object user. Only members may exist, no implementation. A given class may implement any number of interfaces. abstract class: can’t instantiate, used to define common behavior for derived types, can have implementation. structs are value-types. classes are reference-types. interfaces do not derive from a common base interface like IUnknown. enumerations derive from System.Enum and by default the storage used to hold them is a32-bit integer. delegates are the same as a type-safe C-style function pointer. They derive fromSystem.MulticastDelegate. Assembly: contains a manifest, CIL instructions, and metadata describing the classes contained therein. Assemblies are self-describing. Because of this, there is no need to register them into the system registry. .NET binaries (.dll and .exe) have no internal similarities to their equivalents in COM servers and Win32 binaries. .NET binaries contain CIL (common intermediate language) and type metadata; they don’t contain platform-specific instructions. 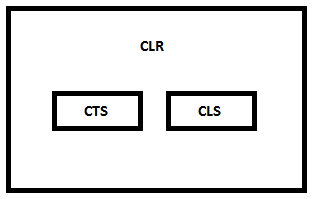 CIL gets compiled to platform-specific instructions until absolutely necessary, usually when a block of CIL instructions (like a method) is referenced by the .NET runtime. Assemblies contain metadata, which describes a class’s base class, the interfaces it implements, as well as a description of each member in the class. Metadata is always present. Manifest: metadata about an assembly. Current version of the assembly, culture info, as well as a list of externally referenced assemblies needed at runtime (.assembly extern mscorlib).